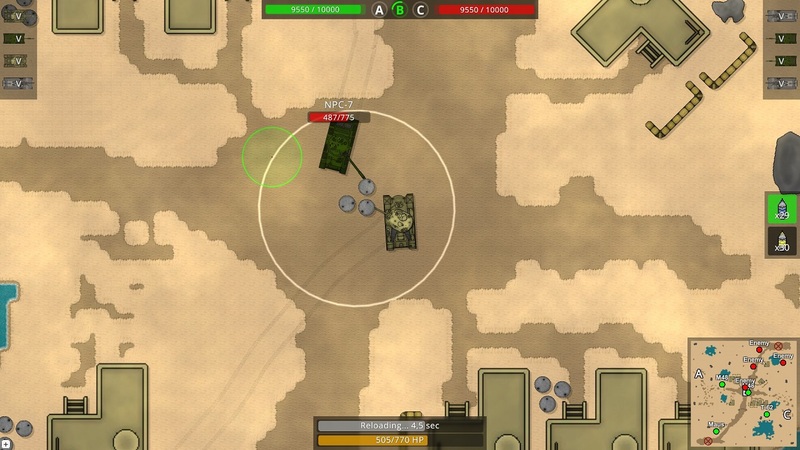 Before going into detail about new features, we will first take a look at the new tanks in this update. As you can see, the first american tanks are finally here. All of them are medium tanks with high mobility values and a decent gun for their tier. There also is a tier 2 premium Sherman with a 105mm gun available. It’s firing deadly HE and HEAT shells at a low rate of fire. Your new AI friends are able to use these tanks, so keep an eye out for them! To learn more about AI tanks, please take a look at the latest dev blog article. The matchmaker also needed some adjustments to support the AI tanks. If you are waiting for more than 15 seconds for a battle, an empty battle will be created now. Other players are still able to join that empty battle for a short period of time. Once the battle starts, all open slots will be filled up with AI players. This also means that there are no unequal battle situations like a 3vs2 or a 5vs4 anymore. The matchmaker will automatically add AI players to balance the teams instead. Speaking of matchmaking, let’s take a look at the new game mode. The old single-point capture game mode has been replaced with a new mode called “Zone Control” on a completely new and bigger map. Both teams will start with 10.000 tickets that decrease automatically over time. Every zone captured by your team will increase the enemy ticket drain. You also can steal tickets from the enemy by destroying one of their tanks. The first team that destroys all enemy tanks or drains all their tickets wins. And there is still more. To add more visibility to your game progress, player statistics have been added, or at least the first basic version of it. Your battle statistics are now tracked and visible to you. You can open the window by clicking on your name in the garage screen. Tank statistics (kills, deaths, wins, earned exp, etc.) are tracked already as well, but not visible yet. A good indicator for your game progress is the new player level. 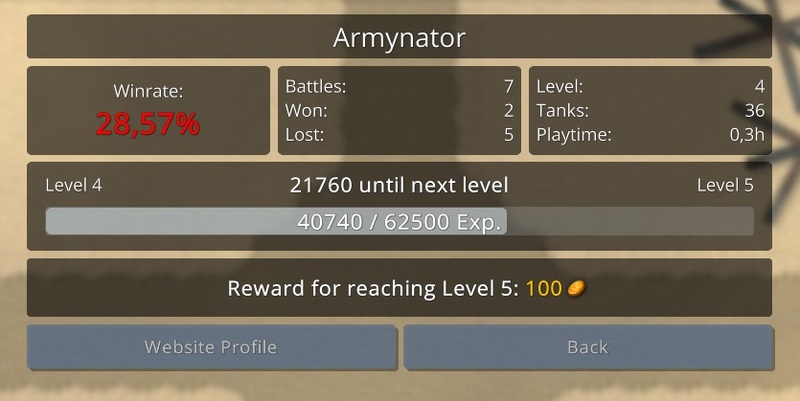 Earned experience in battle will increase your level, allowing you to earn rewards for each level-up. Keep in mind that only base experience is added to the level progress. This means that premium playtime and premium tanks won’t affect your progress speed. Only plain battle performance works here. With a coming update you will also be able to see other players statistics, and more different stats will be added soon. A website integration is planned as well, so stay tuned! Update 0.1.5 also contains two new translations: spanish and polish! Our community members UnDerBY and Matfyei translated the whole game client to spanish and polish in just a single day, and they did an amazing job. So if you see them ingame, feel free to say thank you! To change the game language, open your profile on the website and set your main language there. If you are playing on Steam, right-click the game in your library, select properties and go to the language tab. Please note that the website itself has not been translated yet. While you can choose to see the website in spanish or polish, it will remain english. Some news might be translated already though. And as announced last update, the game is coming to Steam. The game will be most likely released on Steam with the next update in the coming weeks. Feel free to add it to your wish list and follow it on the Steam shop page. If you want to test the Steam version already, please let us know on Discord! We may still have a Steam key left over for you. There also have been many client- and server optimizations, balance changes and UI improvements. For a bit more detailed changelog click here. Thats all for now. See you on the battlefield!